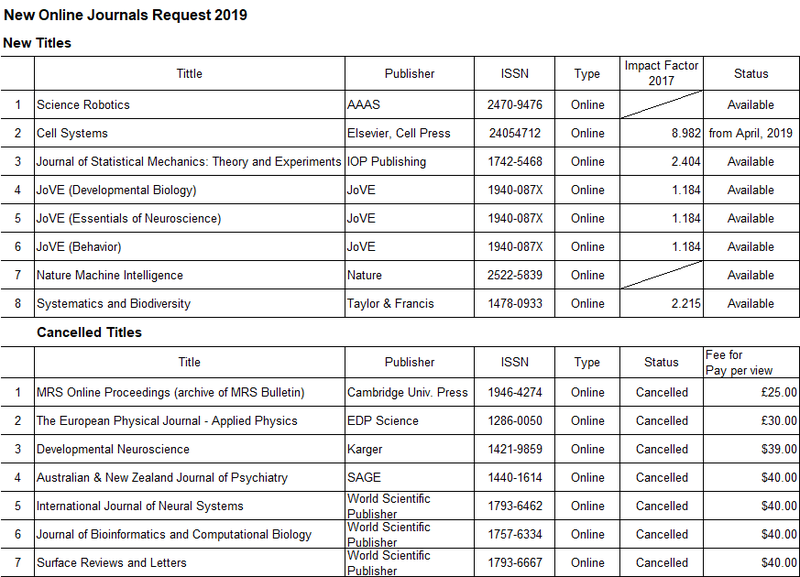 The following is a list of new and cancelled journals for Year 2019. If you have any questions about this email, please send email to library@oist.jp. 1 month trial of some JoVE (Journal of Visualized Experiments) collections is available to you until November 14, 2018. Reprints Desk is a document delivery service which makes it easier than ever before to order documents from anywhere in the system with a click of a button. You can directly search and order the articles you need, instantly acquire PDF documents and pay by direct payment (即支出) each month. Check the New Books Arrival at the Libary counter. Oxford Scholarship Online is available until Feb. 28, 2019. Check and see the New Book Arrival at the Library Counter. 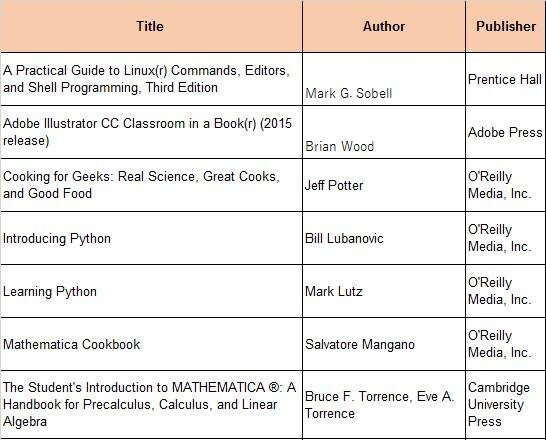 Here is the list of newly purchased eBooks from Springer. The library is hosting Web of Science Seminar for all OIST staff and students on January 16, 2018. We will invite an expert of Web of Science from Clarivate Analytics (formaer Thomson Reuters). The seminar will highlight the content as well as the features and tools of Web of Science to reveal citation connections and support research discoveries and publication. There are two courses for Beginner and Intermediate, and you may choose to attend one or both courses. SciFinder Help Desk will be open at the Library Office from 1:00 to 3:00 pm, on Nov. 15 (Wed). SciFinder is the only research tool with access to the world’s most reliable and largest collection of substances, reactions and references (from both journals and patents). A global network of scientists update content daily to ensure you have access to the most timely and accurate information available. This collection contains a large selection of multidisciplinary e-books representing a broad range of academic subjects. The breadth of information available through this package ensures that students and scholars will have access to information relevant to their research needs. Some printed versions of the popular Safari Books are available now! On and after Sep 1st, OIST Library is no longer subscribed to Safari Online Books. However, we decided to purchase highly used books as print books. so please do not worry if you have been using Safari books (Cancelled titles are listed in the File Attachement in the below). Paid Trial for Wiley Online Books until Feb. 28, 2018. We have arranged for a paid trial of Wiley Online Books for 6 months, which will be available to you until February 28, 2018. You have online access to more than 18,000 monographs, handbooks, dictionaries, companion and landmark book series except Online Reference Works. Here are the new books arrived at the library. Please add them on your summer reading list. It's rainy season in Okinawa. That means it's time for extra reading! Please enjoy these new books at the library. National Geographic magazine is now available at the library. It mainly contains articles about science, geography, history and world culture. Tips: Just look for yellow rectangular border magazine! Only OIST members can access electronic resources. On-Campus: E-resoruces are accessible from any computers connected to the campus network. Off-Campus: E-resources are available outside of campus through VPN service. To use VPN service, please go to IT section's site. Paid content of institutional contract for "CiNii Articles" is available from April, 2014. CiNii Articles, a database service provided by NII enables you to search information on academic articles published in academic society journals, university research bulletins or articles included in the National Diet Library's Japanese Periodicals Index Database. Search results may be viewed by anyone without having to register. "ebrary" is an ebook platform which contains over 110, 000 academic titles in 16 fields from authoritative publishers. Quick User Guides are available in English and Japanese. F1000 is an in-depth directory of the top articles in biology and medicine, as recommended by the Faculty. Like PubMed, you can search by keywords, and you can also browse the entire archive, or just the disciplines and specialties that interest you. New article recommendations are added to the site daily. OIST Library has implemented "Article Select Tokens" which can be used to pay for full-text downloads from WILEY since we canceled 13 low usage titles from the publisher. Please go to the link below to learn how to use the tokens - we have Option 1: IP-address-only control. The library has initiated a service to facilitate acquisition of full text digital reprints from diverse literature databases.